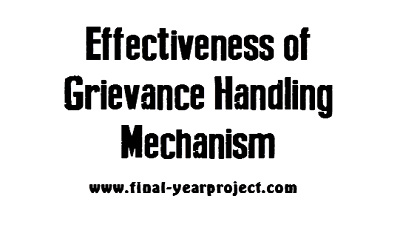 This is MBA summer project report on effectiveness of grievance handling mechanism. This study focuses on Effectiveness of Grievance Handling Mechanism at Lucas-TVS Limited. Grievance is any kind of dissatisfaction with regard to pay, promotion, suspension, working condition etc. The grievance mechanism ensures a fair and just treatment of employee’s concerns and prompt resolution of grievances without discrimination, coercion, restraint or reprisal against any employee who may submit or be involved in a grievance. You can also Subscribe to FINAL YEAR PROJECT'S by Email for more such projects and seminar. 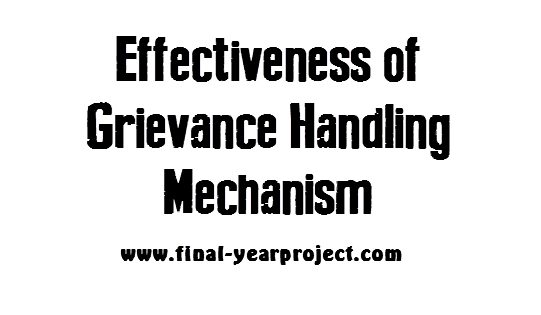 The aim of the study is to find whether the grievance handling mechanism ensures that employee’s problems are recognized and appropriately reviewed in a prompt and timely manner. The grievance mechanism acts as a foundation for a harmonious and healthy relationship between employee and employer.